Soon to be former John Willcock College Chaplain Brunno Santos has a magnetic effect on students and a buoyant influence on staff. This week, College students and staff will bid a fond farewell to their Chaplain as he embarks on a new career with WA Police. Associate Principal Waneen Bennett said Brunno’s departure would be felt across the campus. “He truly serves others and is such a valuable part of our team,” she said. “He will be missed immensely and if we could clone him we would a million times over, we’d have a million Brunno’s around,” Ms Bennett said. Mr Santos has been working at the Middle School for the past three years. 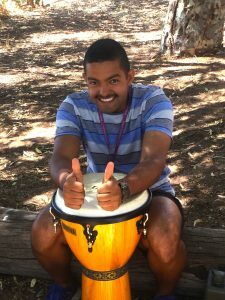 He runs several programs including Boys Skills Tools and Drumming workshops, as well as supporting up to twenty self-referred and triaged students a week. Student Services Manager Craig Tapper said students flock to Brunno’s engagement programs. “His ability to connect with the kids and build the relationship so quickly has to be seen to be believed,” he said. Year Nine Student Reece Kelly said the Chaplain had helped him in many ways including his search for a part time job. “I tried for four months and had no luck and Brunno did not give up on me, he let me come in every Monday to do my interviews and calling places,” Mr Kelly said. Reece is now working after school in customer service. Next year he’ll participate in a vocational program called VIP that includes weekly work experience. He says the Chaplain helped also him find work placement and get into VIP, as well as assisting with a literacy support program. “I needed someone to read with me and Brunno has been doing it everyday for the last three terms. I just come in here he will make me a milo and we just hang out and read,” he said. In 2018 Mr Santos will commence training for the WA Police, a career move he has aspired to for several years, he said the aim is to work with youth again in the future. He enjoys catching up with former students and seeing that they are doing well. Mr Santos has secured a position in Geraldton when his training is completed. John Willcock College student services hope to continue with the Chaplain program in 2018.